Sure, you can play Hearthstone on your tablet, but it might be a little too early to start teaching your little cousin who’s still teething about mana curves. 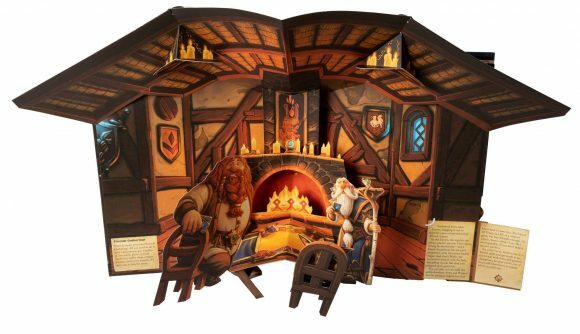 For her – or for any Hearthstone fan, really – there’s a Hearthstone pop-up book coming out this year, just in time for the holidays. The book is an introduction to Hearthstone’s nine major heroes, and the promotional copy says it includes its own “stunning arena battle” brought to analog life with paper pop-ups. The art is by Mike Sass, who’s done illustration for Magic the Gathering and World of Warcraft. Sass also worked at BioWare for 12 years, providing art and animation for games like Baldur’s Gate and Knights of the Old Republic. Amazon has Simon Arizpe listed as the author of The Hearthstone Pop-Up Book, but he’s an accomplished illustrator, paper engineer, and professor – in addition to his academic credentials, he also created a tie-in version of the pop-up book featured in The Babadook. The Hearthstone Pop-Up Book also features mini-booklets on certain pages, each containing their own little pop-ups – which as PC Gamer notes are actually just called ‘pops’ in the business. If this sounds like something your little cousin (or anyone else) might like, you can pre-order on Amazon now. It’s listed for $65.00 USD, although Prime members get a nice 38% discount and can reserve copies for a cool $40.41. It’ll be released November 6.